Smashwords today announced Special Deals, a new merchandising feature at the Smashwords Store that showcases onsale books. Effective immediately, your onsale ebooks will receive automatic merchandising through the Smashwords Store’s myriad book discovery options. Most authors know Smashwords as the world’s largest distributor of indie ebooks to retailers and libraries, and this remains our primary business focus. But did you also know that thousands of Smashwords authors use our small Smashwords Store as their personal ebook promotion platform with profile pages, widgets, Smashwords Interviews (self-interviews), Smashwords Alerts (automated new release notifications to readers) and coupons? The new feature is powered by Smashwords Coupons. Click the box for "Make this a public coupon"
To run a sale, click to your Dashboard’s Coupon Manager screen, click “Generate coupon” or click to reactivate or edit an existing coupon, then follow the simple instructions to make your coupon public. Of the many book marketing tools provided to Smashwords authors at no cost, Smashwords Coupons have been one of our most popular tools since we first introduced the capability almost ten years ago. 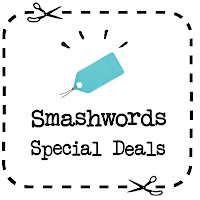 Each month, thousands of Smashwords authors use Smashwords Coupon codes to run custom ebook promotions. Authors can create coupon codes to run exclusive private (the most common form of Smashwords Coupon) or public promotions, all the while earning industry-leading royalties up to 80% list. 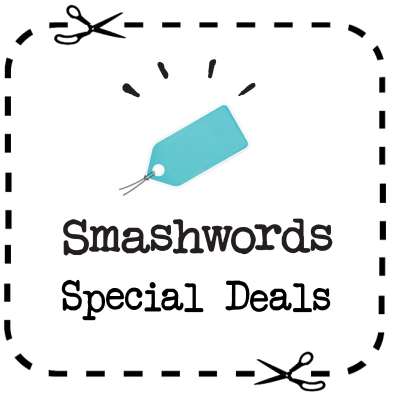 We’ve continually enhanced the Smashwords Coupon feature since its first introduction. In the last 12 months alone we added campaign tracking (unique labels attached to each coupon to enable campaign sales tracking), metered coupons (limiting the number of redemptions if you want to create urgency with a first-come first-served get-'em-while-they-last promotion) and most recently in December, public coupons (the option to expose your coupon codes directly on your book pages). As with our all Smashwords Coupons, Special Deals will not change your price at retailers (if you want to run a sale at all Smashwords retailers, change the book's price in your Dashboard). 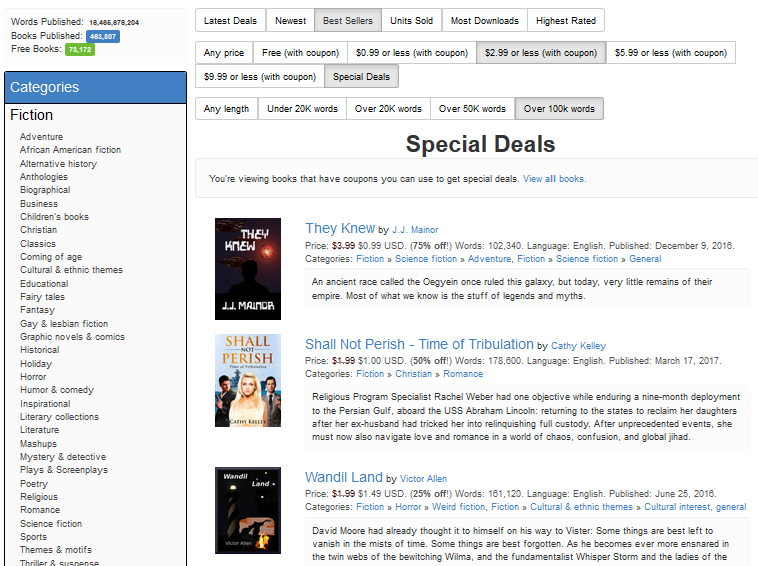 For readers, Special Deals makes it easier than ever to discover onsale ebooks at Smashwords. Most of these deals are exclusive to Smashwords. Readers can browse the Special Deals catalog from the Smashwords home page and filter by category, book length, latest releases, bestsellers, after-coupon prices, and highest-rated. Books with Special Deals are also discoverable in all other online catalogue searches. Customers can take advantage of Special Deals simply by adding the onsale ebooks to their shopping carts. No need for readers to enter coupon codes! Although this new feature increases the visibility of your onsale ebooks, to get the most out of your sale you’ll still want to get out there and actively promote your deal on social media and to your private mailing lists. If you've got a large readership or social media following, Special Deals is a great way to run short term flash sales. You can spice up your promotion and make it more compelling by combining other Smashwords Coupon features such as using our metered coupons to make your special deal available to the first [you specify] number of readers who take advantage of it, or by giving your Special Deal a short expiration. When you promote your Special Deal, be sure to link directly to your book’s book page at Smashwords to maximize your conversion rates from browser to buyer. If you’re able to drive enough sales from your personal promotion efforts, it can cause your book to rise in the sales rank at Smashwords which then will increase the visibility and desirably of your books to other shoppers who browse our bestseller lists by category, price or book length for their next great read. Since our store is small, it doesn't take a lot of sales to significantly boost your rank. Thank you for another great opportunity! Your coupons are a fantastic idea, one that makes authors' lives easier. With coupons, I don't have to change the prices at all the vendors. Even going through Smashwords, that's a chore, and then there's the Amazon price-matching, which really gums up the works. I think your coupons can make the Smashwords store competitive with the other vendors, if you want to go that way. In general, thanks for Smashwords. I think Smashwords is the the best deal out there for authors, and you deserve all the success that comes your way. I love the coupons, but there's one feature I think is sorely lacking which would be a boon for publishers like me who represent multiple authors with nearly 400 works for sale. And that is the ability to put multiple works on sale using the same coupon code much like the summer/winter sale without having to wait for July to roll around. All right - this is a great idea! I've taken advantage of it already. Great idea! Can it be used for Kindle Books too? Bestman, if you have the mobi format available at Smashwords, it'll work for that since one purchase at Smashwords entitles the reader to download any of the file types the author's making available at Smashwords. I guess these coupons can't be used anywhere except Smashwords. It will be nice if you can provide such a facility to make use of discount features in other retailers as well to whom you distribute. Otherwise it is not much of use.